Students sample college life by staying on campus in a co-ed dormitory, where they are accompanied by male and female chaperones made up of NJIT faculty and students. Each program is devised to give students a basic understanding of design using state of the art technology and cutting edge methods. Field trips may be organized to explore local design and culture in and around NYC. * ​Eligible students must be entering sophomore, junior or senior year of high school by the Fall of the year they plan to attend the program. Students will work toward a design project with an emphasis on "making" - both by physical and analog means. It will be an introduction to the concepts and techniques of the disciplines of architecture. Students will use a variety of digital modeling and fabrication methods to explore contemporary ideas of space and form. They will take a field trip to New York City and engage with contemporary architecture and design. At the end of the week long intensive, the students will present their design projects to their peers and the faculty. This session builds upon the introductory lessons introduced in Intro to Architecture. 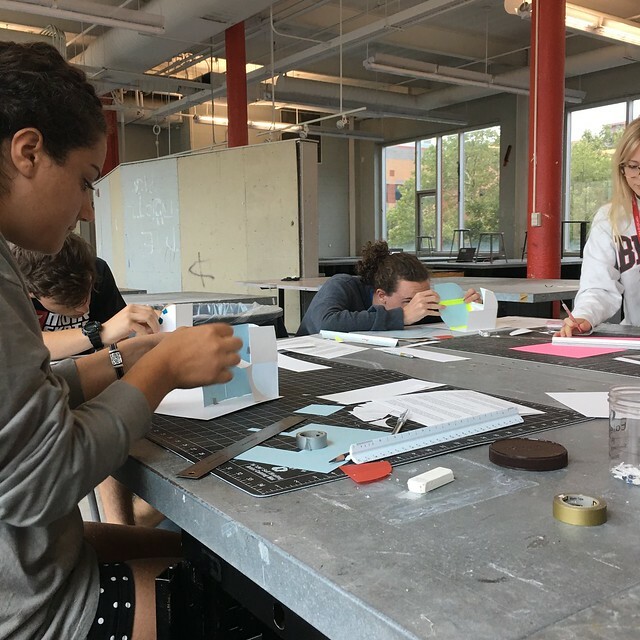 Students will become more familiar with the methods, concepts, and techniques used in the study of architecture at the collegiate level. Additional investigation of architectural and interior concepts of space and form using advanced digital software tools. Be both artist and engineer by making beautiful things that work. This hands-on program will expose you to the various physical and digital media, design methods and state-of-the-art fabrication tools that will bring to life your own unique and functioning products. Learn the concept of design thinking, a process the will take you from brainstorming, to developing, to prototyping, to “pitching” your creations. The session will also provide an opportunity to learn software that will be instrumental in the use of digital fabrication technologies. Participants will work hands-on with a “smart” material – a shape memory alloy – that acts as an artificial muscle to create kinetic assemblies. Digital scanning techniques will be introduced as a means of bringing the physical world into the digital world and laser cutting, 3D printing and CNC cutting as a way of bringing the digital world into the physical world. This program will introduce students to the elements of design that are essential to the creation of interior environments. You will have the chance to design your own interior project using a variety of traditional and digital techniques. Learn how sketching, model-making, and collage techniques can be used to explore the design process and realize your creative vision. The program is designed to encourage students to become comfortable sharing ideas, presenting, and drawing inspiration with peers. Studio work will be enhanced with field trips to NYC sites as well as furniture and fabric showrooms to discover how materials, lighting, and color all contribute to our experience of interior space. “Play, learn and make in VR technology!” Learn how to create interactive Virtual Reality experiences on the Oculus Rift and HTC Vive VR systems. This hands on program uses our extensive teaching labs to design and execute interactive experiences. Students will develop and pitch ideas for immersive games. Students will then create these games and prototype them in a Virtual Reality system. This program will provide an opportunity to learn imaging, 3D modeling and game design software in a hands on environment. Softwares used include Adobe Photoshop, 3DS Max and the Unreal Engine. At the end of the week, the students will present their VR projects in an open VR “arcade” style event! “Design and make a platformer computer game!” Learn the principles of game design in this hands on program. Students will use our extensive teaching labs to design and execute a platformer style computer game. Students will develop and pitch game ideas based on research of historical games. Students will then create these games through the building of 3D models, texture and simple interaction scripts. This program will provide an opportunity to learn design, 3D modeling and game design software in a hands on environment. Softwares used include Adobe Photoshop, 3DS Max and the Unity Game Engine. At the end of the week, the students will present their games in an open “arcade” style event! “Learn about typefaces, poster design and printing!” Learn the basics of book and poster design in this hands on design program. Students will use our state of the art facilities to learn the Adobe Creative Cloud Suite of graphic design tools. Short projects through the week will teach the basics of typography and layout for posters and book design. At the end of the week, the students will present printed posters and digital book projects! Click here to go to the Dates, Pricing and Registration page. Registration is now open. If you require more information regarding program details, registration, or other inquiries contact us at coadsummer@njit.edu.